Mission and Goals - Making a Difference Now!! Making A Difference Now (MADN) is a Lexington KY-based 501(c)(3) nonprofit whose mission is to help animals and the people and organizations that serve them; to support other organizations with similar goals; and to advocate for animals everywhere. 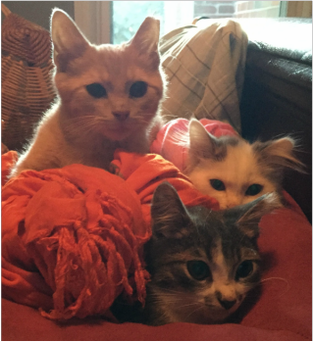 These three kittens were rescued from a community cat colony, spayed/neutered, fostered and socialized, and adopted into loving homes. The adults in their colony were spayed/neutered and returned to their colony to live out their lives in their outdoor home without producing any more homeless kittens. Best Friends Animal Society estimates that 1.5 million healthy cats and dogs are put to death in shelters every year simply because there are no homes for them. That is 4,100 healthy cats and dogs every single day! Countless millions more face lives of hardship on the streets, suffer at the hands of abusive individuals, or are abandoned by their humans. MADN helps with all these crucial immediate needs. As an animal welfare/rescue organization rather than a shelter, MADN does not match the Basic Data Matrix used by Shelter Animals Count very well. In particular, MADN's work to provide training and support for other individuals/organizations and TNR for community cats is not captured in this system. Nevertheless, we believe it is important to use the matrix where possible to promote comparability and compatibility with Shelter Animals Count data, so the matrix we include below is a modification that attempts to be true to the Shelter Animals Count concept while capturing more of our work. MADN wholeheartedly supports Shelter Animals Count efforts to create a national database of animals in our nation’s shelters. Like many small nonprofits, especially volunteer-only nonprofits, MADN has not done a great job collecting data, neglecting to note the number of cats in colonies, or the number of kittens rescued with their moms, or the number of puppies rescued from a parking lot, for example. Because we try to improve every year, our data collection and reporting systems may vary from year to year. 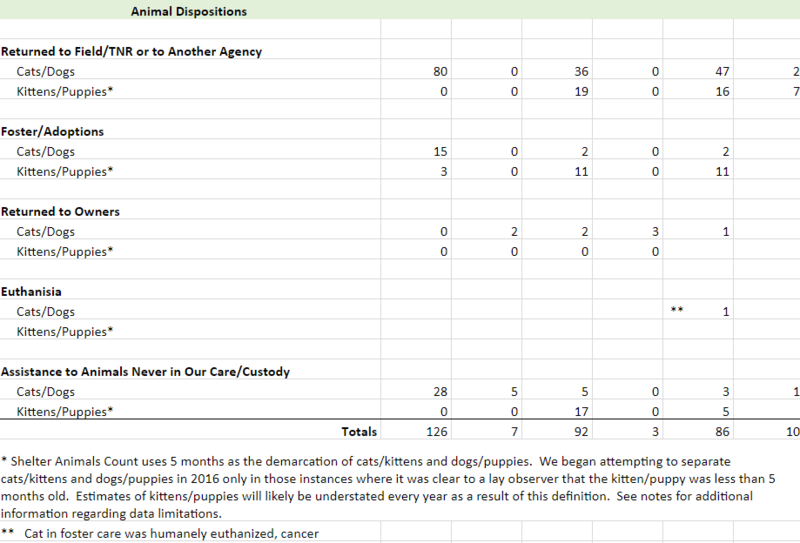 We added the kittens/puppies category to our matrix in 2016 with this caveat: We will indicate that an animal is a puppy or a kitten when it is clear to a lay observer that the animal is younger than 5 months. As a result, our numbers of kittens/puppies will likely be consistently understated. We also created two new categories in 2016: Assistance to Caretakers (Community Cat Colony caretakers generally) and Direct Colony Care. There is some overlap among our categories and we will continue to refine them. Sadly, in 2018, we added euthanasia to our matrix when a sweet cat in foster care was unable to respond to treatment for his cancer. Our matrix data approximates the Shelter Animals Count official matrix. Totals may not match for various reasons; a community cat may be TNRd and then adopted later, for example. This chart does not include requests to help animals other than cats and dogs. Numbers are approximations and are likely underestimates in all categories.